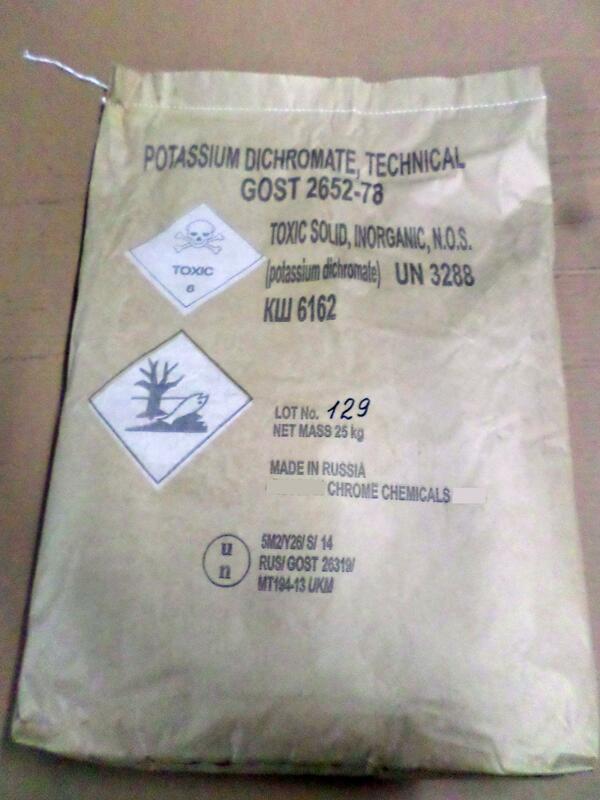 Potassium dichromate is known by many names such as Potassium bichromate, bichromate of potash, dipotassium dichromate or as formula K2Cr2O7. Potassium dichromate is in our stock in the Netherlands. We are successfully exporting this product, as metal surface treatment to aerospace an defence industry world-wide. Potassium bichromate(VI) is a fine, bright red crystalline. As a result of its oxidizing properties, it can be used as an oxidizer in a variety of industries. Examples are cleaning-, metal surface- and safety-match producers or as printing images in photography. Note! This product is a hazardous substance and can harm your health and the environment, if used incorrectly. Always look at the applicable symbols and Material Safety datasheet. Only for professional use! Our Potassium dichromate has a minimum of 99,7 % K2Cr2O7,, with very low impurities. Gentrochema BV has a full REACH registration for potassium dichromate. An extended Safety datasheet ( e-SDS) or Chemical Safety Assessment is available for all buyers. We have submitted an Application for Authorisation (AfA) at ECHA ! In general the delivery will take 2-3 working days, but his depends on your order. Of course, we are able to offer free delivery to all destinations world-wide. Buy potassium bichromate at Gentrochema chemical wholesale. Gentrochema is specialized in the trading of niche chemical products on a global scale. In order to buy chemicals you must be 18 years of age or older and registrated as a legal company. Gentrochema will NOT sell any chemical products to private persons.